HONOLULU — Seabury Hall’s Veronica Winham covered her mouth in shock. 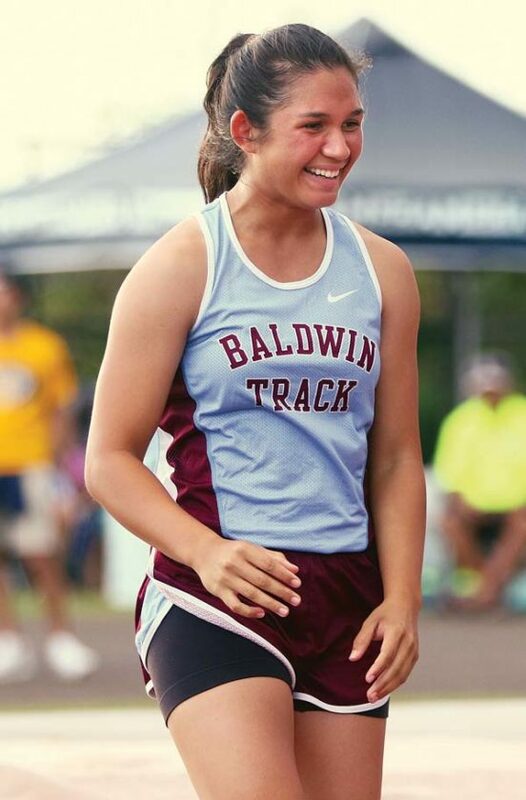 The senior had just claimed her third gold medal, two of which were photo finishes, during Saturday’s Island Movers Track and Field State Championships at Kamehameha Kapalama. “It feels so amazing, I just wanted to win one and three just blows my mind. Oh my God, wow,” Winham said. Winham won a footrace in her first event, finishing in 4 minutes, 50.27 seconds — just 0.03 seconds ahead of Punahou’s Maiya Fujiwara in the 1,500 meters. She followed it up with a 2:20.30 time in the 800, which beat her teammate Chloe Gangnath by 0.18 seconds. Winham won the 3,000 by a more comfortable 1.56 seconds ahead of Iolani’s Aya Margraf, who finished second in 10:50.83. 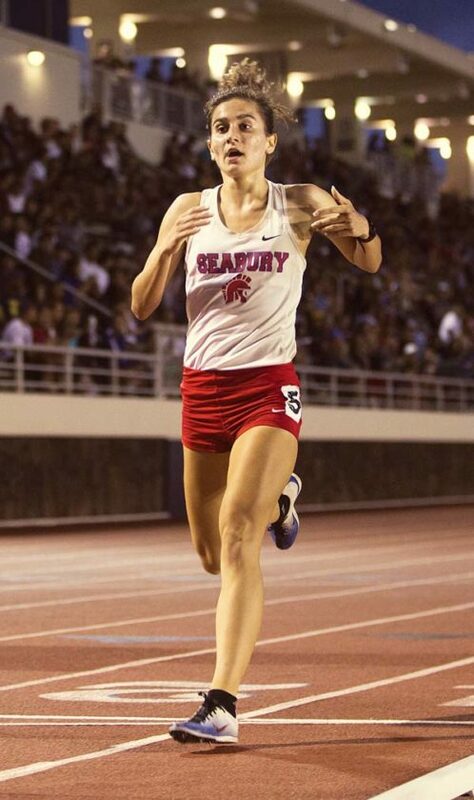 It is the second straight year a Spartans runner has swept the three distance races — Ava Shipman closed out her prep career by accomplishing the feat at last season’s state meet. 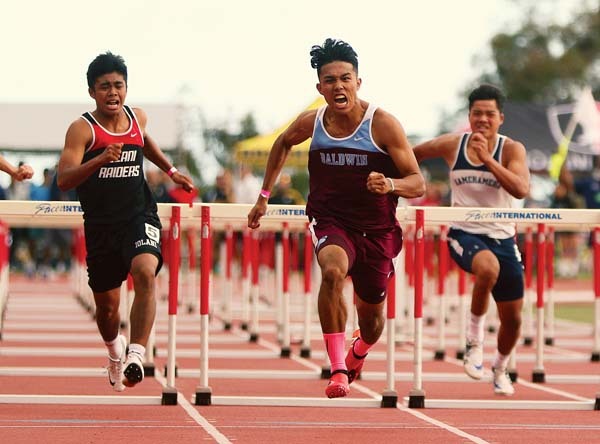 Baldwin’s Rey Cadiz defended his state title in the 110 hurdles, but also stole the 300 hurdles despite tweaking his hamstring during the meet. The junior outran Punahou’s Lucas Milne by 0.08 seconds to finish first in 38.90. 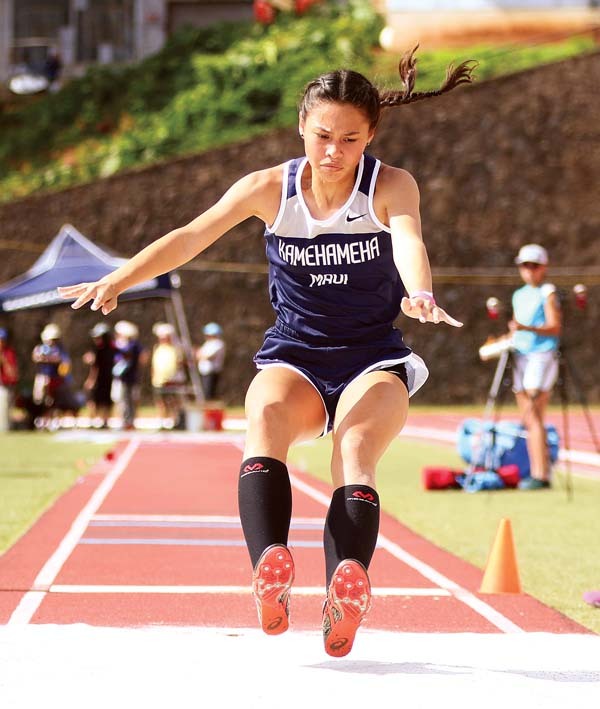 Maui Interscholastic League schools claimed 10 gold medals at the two-day state championships, including wins by Kamehameha Maui’s Micah Au-Haupu and Keely Logan. The two winners became the school’s first-ever gold medalists Friday: Au-Haupu in the shot put and Logan in the high jump. Au-Haupu’s throw of 51 feet, 3.25 inches beat Punahou’s Alama Uluave by a quarter of an inch. Logan won a jump off against Iolani’s Kellie Okamura at 5-1. “After she missed I was like, ‘I’ve jumped this, I got this, let’s do this,’ “ Logan said Saturday. “It’s so cool. It’s amazing. Warriors coach Rudy Huber said he was proud of the school’s first gold medalists. 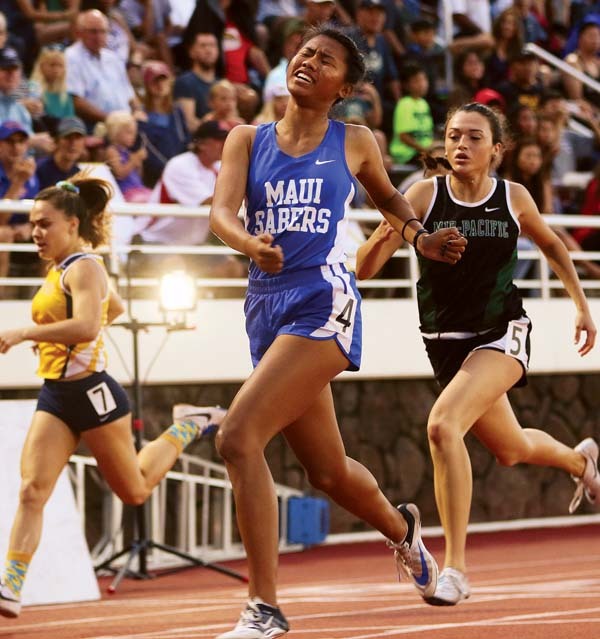 Maui High’s Alyssa Mae Antolin fell on the wrong side of a photo-finish, losing to Kamehameha Hawaii’s Chenoa Frederick by 0.05 seconds in the 100. The junior, however, bounced back to claim her first state gold medal in the 200 in 25.01. 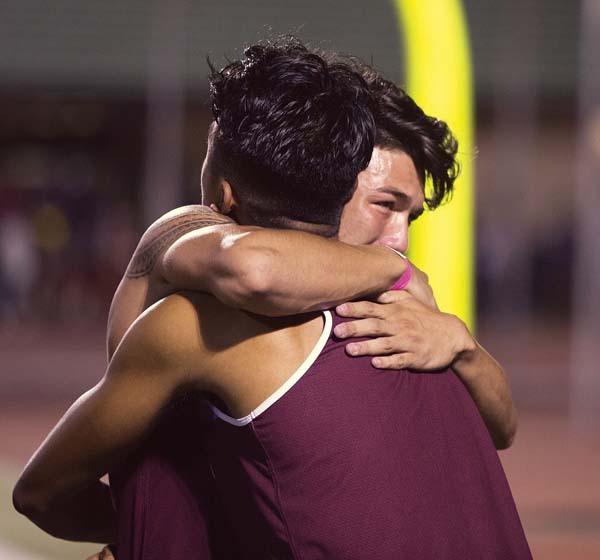 Antolin felt added pressure for the state meet after missing the MIL championships due to her school’s prom. In the girls pole vault, Baldwin’s Tianna Powell upset Punahou’s Kira Watanabe by clearing 12 feet — a full foot higher than her personal best. Powell said she was shocked when she cleared the winning height. The Bears’ Shawn Silva claimed gold in another close finish in the boys high jump, winning a tie-breaker against Saint Louis’ Korvin Feagins and Kapolei’s Easton Phillips at 6-4. Silva went to his knees and cried after being told he had won. “I don’t know what to say, brah,” Silva said. “From the beginning I knew I could’ve made an impact for my team these past three years. It’s just good to come out this year and give it my all and take the title. Baldwin coach Tracey Enos congratulated his boys team for their second-place finish of 61 points. Punahou won the boys team title with 92. The Spartans girls also took second, finishing 64 points behind the Buffanblu’s 114. Girls–1. Punahou 92, 2. Seabury Hall 61, 3. Kamehameha Hawaii 46, 4. Iolani 42, 5. Mililani 25, 6. Hawaii Baptist 24, 7. Leilehua 21, 8. Maui High 18, 9. Baldwin 17, t10. Kalani 16, t10. Aiea 16, t10. Hilo 16, 13. Kauai 14, t14. Kamehameha Maui 12, t14. Mid-Pacific 12, t16. Kamehameha Kapalama 10, t16. Campbell 10, 18. Damien 8, 19. Radford 7, 20. University 6, 21. Hawaii Prep 5, t22. Castle 4, t22. Waiakea 4, 24. Kaiser 3, t25. King Kekaulike 2, t25. Kealakehe 2, t25. Molokai 2, 28. Le Jardin 1. Boys–1. Punahou 114, 2. Baldwin 50, 3. Saint Louis 44, t4. Konawaena 28, t4. Iolani 28, 6. Kamehameha Kapalama 27, 7. Leilehua 21, t8. Kaiser 18, t8. Kealakehe 18, t10. Kapolei 16, t10. Campbell 16, t10. Kalaheo 16, 13. Hilo 14, 14. Radford 13, t15. Waipahu 10, t15. Kamehameha Maui 10, t15. Castle 10, t18. Hawaii Prep 8, t18. Kapaa 8, t20. Hanalani 6, t20. McKinley 6, 22. Lahainaluna 4, t23. Farrington 2, t23. Mililani 2, t23. Waiakea 2, t23. Mid-Pacific 2, t27. Pearl City 1, t27. Kamehameha Hawaii 1, t27. Waianae 1. Discus throw–1. Taegan Keep, Kauai, 127-4; 2. Mele Vaka, Hilo, 126-0; 3. Leslie Mamai-Lagafuaina, Aiea, 119-7; 4. Leona Toledo, Hilo, 114-9; 5. Tai-Li Tangatailoa, Molokai, 113-7; 6. Sera Utoafili, Iolani, 113-4; 7. Nata Suguturaga, Punahou, 111-0; 8. Taylor-James Sullivan, Kamehameha Hawaii, 110-2. Triple jump–1. Chenoa Frederick, Kamehameha Hawaii, 39-10; 2. Nikki Shimao, Iolani, 37-3.50; 3. Sheree Tam, Kalani, 36-6.75; 4. Gemma Palleschi, Hawaii Prep, 36-6.25; 5. Sascia Campos-Ewaliko, Baldwin, 36-1.25; 6. Stevie Marvin, Punahou, 35-1; 7. Cameryn Ann Nagaji, Iolani, 34-11; 8. Sade Mizusawa, Sacred Hearts, 34-9.75. High jump–1. Keely Logan, Kamehameha Maui, 5-1; 2. Kellie Okamura, Iolani, J5-1; 3. Angela Howell, Radford, 5-0; 4. Malie McClure, Kamehameha Kapalama, 4-10; 5. Charlie Abreu, King Kekaulike, J4-10; 6. Waileia Edwards, Kauai, J4-10; 7. Alisha Dingman, Kihei Charter, J4-10; t8. Selena Chow, Kamehameha Kapalama, 4-8; t8. Kiki Megorden, Punahou, 4-8; t8. Sydney Snyder, Maui Prep, 4-8; t8. Anna Praywell, Punahou, 4-8; t8. Cameryn Ann Nagaji, Iolani, 4-8. Shot put–1. Micah Au-Haupu, Kamehameha Maui, 51-3.25; 2. Alama Uluave, Punahou, 51-3; 3. Ahofitu Maka, Punahou, 49-11; 4. Josh White, Saint Louis, 48-7.75; 5. Logan Faitau, Farrington, 48-2.75; 6. Atui Valu, Waianae, 46-2; 7. Hiram Anakalea, Kealakehe, 46-0; 8. Apakasi Felemi, Lahainaluna, 44-8.75. Long jump–1. Andrei Iosivas, Punahou, 23-3; 2. Zion Williams, Kapaa, 21-1.25; 3. Justyce Kahunahana-Simms, Kealakehe, 20-10.50; 4. 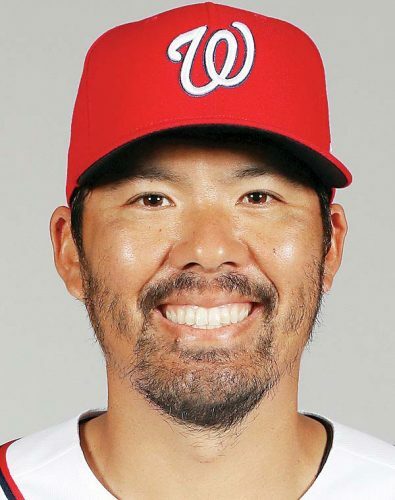 Kawika Clemente, Kamehameha Kapalama, 20-8.25; 5. Darrian Cremer, Baldwin, 20-7.75; 6. Kamoi Latu, Saint Louis, 20-7; 7. Dylan Blane, Kamehameha Kapalama, 20-4; 8. William Kamaka, Waimea, J20-4. Pole vault–1. J. Kai Yamafuji, Punahou, 14-4; 2. Edward Omine, Baldwin, J14-4; 3. Kainoa Andrade, Kamehameha Kapalama, J14-4; 4. Jacob Thompson, Kamehameha Kapalama, 13-10; 5. Eric Cabais-Fernandez, Waiakea, 13-4; 6. Shawn Silva, Baldwin, 12-10; 7. Tyler Park, Kamehameha Kapalama, J12-10; 8. Hunter Worth, Kamehameha Maui, J12-10. Shot put–1. Leslie Mamai-Lagafuaina, Aiea, 42-8.50; 2. Zada Tagovailoa, Damien, 37-4.75; 3. Tioleaoauli Posiulai, University, 36-9.25; 4. Mele Vaka, Hilo, 36-4.25; 5. Taysia Pimemtel, Seabury Hall, 36-3.50; 6. Gafaolaufi Ale, Aiea, 35-9.75; 7. Jordan Zarate, Hawaii Prep, 35-9.50; 8. Taegan Keep, Kauai, 35-6.25. Long jump–1. Chenoa Frederick, Kamehameha Hawaii, 17-5.75; 2. Kimberly Owens, Leilehua, 17-0.50; 3. Azure Chung, Kalani, 16-9; 4. Sela Panuve, Baldwin, 16-7.50; 5. Kiana Over, Kamehameha Maui, 16-7; 6. Sascia Campos-Ewaliko, Baldwin, 16-4.50; 7. Gemma Palleschi, Hawaii Prep, 16-3; 8. Arianna Lovell, Kamehameha Kapalama, 16-2.50. Pole vault–1. Tianna Powell, Baldwin, 12-0; 2. Kira Watanabe, Punahou, 11-6; 3. Jaelyn Domingo, Kamehameha Kapalama, 10-6; 4. Mariah Higashi, Waiakea, J10-6; 5. Juliette Lum, Kaiser, J10-6; 6. Elena Yuen, Punahou, 10-0; t7. Teija Tuitele, Kamehameha Maui, J10-0; t7. Brandi Burnett, Kamehameha Kapalama, J10-0. 100 hurdles–1. Madison Moku, Hawaii Baptist, 15.08; 2. Saydee Aganus, Kamehameha Hawaii, 15.28; 3. Lexi Lowery, Punahou, 16.08; 4. Leilani Leopard, Campbell, 16.28; 5. Nikki Shimao, Iolani, 16.30 ; 6. Grace Blanchette, Punahou, 16.54; 7. Cameron Woods, Kalani, 16.88; 8. Ameera Waterford, Seabury Hall, 17.12. 100–1. Chenoa Frederick, Kamehameha Hawaii, 12.52; 2. Alyssa Mae Antolin, Maui High, 12.57; 3. Kealoha Scullion, Punahou, 12.58; 4. Amy Warrington, Mid-Pacific, 12.71; 5. Harley Frye, Leilehua, 12.86; 6. Mackenzie Reed, Mililani, 12.91; 7. Isabella Dillon, King Kekaulike, 12.99; 8. Saydee Aganus, Kamehameha Hawaii, 13.26. 1,500–1. Veronica Winham, Seabury Hall, 4:50.27; 2. Maiya Fujiwara, Punahou, 4:50.30; 3. Chloe Gangnath, Seabury Hall, 4:50.43; 4. Kayla Almeida, Punahou, 4:51.37; 5. Aya Margraf, Iolani, 4:53.87; 6. Kallalei Ryden, Seabury Hall, 4:54.57; 7. Mia Schiel, Punahou, 4:56.04; 8. Sophia Cash, Honokaa, 5:03.06. 400 relay–1. Punahou 48.76; 2. Leilehua 49.80; 3. Mililani 49.81; 4. Kalani 50.56; 5. Iolani 50.99; 6. Kauai 51.02; 7. Kamehameha Hawaii 51.05; 8. King Kekaulike 51.35. 400–1. Kaila Ronquilio, Punahou, 57.06; 2. Allie Little, Punahou, 58.67; 3. Ryanne Navarro, Mililani, 59.29; 4. Chenoa Frederick, Kamehameha Hawaii, 59.45; 5. Jordan Schmidt, Leilehua, 59.52; 6. Hannah Schmidt, Leilehua, 1:00.35; 7. Phoenix Dawn Miranda, Aiea, 1:00.58; 8. Mahina Kaomea, Kamehameha Kapalama, 1:01.66. 300 hurdles–1. Madison Moku, Hawaii Baptist, 44.71; 2. Nikki Shimao, Iolani, 45.57; 3. Leilani Leopard, Campbell, 46.90; 4. Saydee Aganus, Kamehameha Hawaii, 47.37; 5. Mya Fuller, Iolani, 47.62; 6. Kahiau Among, Iolani, 48.13; 7. Melody Lum, Punahou, 48.30; 8. Hannah Hollenbeck, Kaiser, 48.34. 800–1. Veronica Winham, Seabury Hall, 2:20.30; 2. Chloe Gangnath, Seabury Hall, 2:20.48; 3. Maiya Fujiwara, Punahou, 2:20.51; 4. Kayla Almeida, Punahou, 2:22.41; 5. Leann Hamilton, Kealakehe, 2:22.79; 6. Karla Angulo, Radford, 2:25.92; 7. Anna Fujisaki, Punahou, 2:27.16; 8. Mahealani Deenik, Kamehameha Kapalama, 2:29.62. 200–1. Alyssa Mae Antolin, Maui High, 25.01; 2. Amy Warrington, Mid-Pacific, 25.35; 3. Kealoha Scullion, Punahou, 25.50; 4. Kaila Ronquilio, Punahou, 25.55; 5. Mackenzie Reed, Mililani, 25.80; 6. Alia Yamafuji, Punahou, 26.35; 7. Angelina Gonzalez, Roosevelt, 26.48. 3,000–1. Veronica Winham, Seabury Hall, 10:49.27; 2. Aya Margraf, Iolani, 10:50.83; 3. Darby Mulligan, Seabury Hall, 10:52.75; 4. Kacie Kwan, Hawaii Baptist, 10:55.83; 5. Kallalei Ryden, Seabury Hall, 10:59.65; 6. Gianna Sbarbaro, Le Jardin, 11:01.96; 7. Johanna Seng, Hawaii Baptist, 11:04.04; 8. Sophia Cash, Honokaa, 11:05.83. 1,600 relay–1. Mililani 3:58.71; 2. Punahou 3:58.71; 3. Seabury Hall 4:07.52; 4. Castle 4:09.57; 5. Kauai 4:10.73; 6. Kaiser 4:12.76; 7. Kamehameha Kapalama 4:14.49; 8. Leilehua 4:16.20. Discus throw–1. Alama Uluave, Punahou, 166-11; 2. Kalawai’a Pescaia, Kamehameha Kapalama, 162-7; 3. Ahofitu Maka, Punahou, 160-7; 4. Apakasi Felemi, Lahainaluna, 155-2; 5. Kennedy Freeman, Punahou, 148-6; 6. Josh White, Saint Louis, 145-11; 7. Israel Sagapolutele, Damien, 145-8 ; 8. Braxton Victor, Leilehua, 145-3. Triple jump–1. Isaiah Harris, Waipahu, 46-4; 2. Jevon Flippin, Hawaii Prep, 46-2; 3. Kamoi Latu, Saint Louis, 44-8.75; 4. J’Drien Jones, Radford, 44-1; 5. Kovee Rivera, Hilo, 43-5.50; 6. Tai Atkins, Kamehameha Hawaii, 42-7; 7. Micah Williams, Punahou, 42-6; 8. Nicholas Allen, Punahou, 42-5.25. High jump–1. Shawn Silva, Baldwin, 6-4; 2. Korvin Feagins, Saint Louis, J6-4; 3. Easton Phillips, Kapolei, J6-4; 4. Luke Stevens, Kaiser, 6-2; 5. Hugh Donlon, Mid-Pacific, J6-2; 6. J’Drien Jones, Radford, 6-0; 7. Theopholis O’Neal, Pearl City, J6-0; t8. Henry Nixon, Campbell, 5-10; t8. Isaiah Tanner, Lahainaluna, 5-10. 110 hurdles–1. Rey Cadiz, Baldwin, 14.53; 2. Tyler Udarbe, Iolani, 15.03; 3. Lucas Milne, Punahou, 15.40; 4. Dylan Forbes, Hilo, 15.59; 5. James McGary, Leilehua, 15.65; 6. Payton Mulleitner, Kamehameha Kapalama, 15.78; 7. Justyce Kahunahana-Simms Kealakehe, 15.83; 8. Tanner Moku, Kamehameha Kapalama, 16.21. 100–1. Andrei Iosivas, Punahou, 10.85; 2. Jacob Schmidt, Leilehua, 10.90; 3. Roman Wilson, Saint Louis, 11.02; 4. Korvin Feagins, Saint Louis, 11.10; 5. Riley Patterson, Hilo, 11.14; 6. Vincent Terrell, Punahou, 11.15; 7. Keanu Wallace, Saint Louis, 11.31; 8. Austin Ewing, Konawaena, 11.44. 1,500–1. Jason Wang, Iolani, 4:08.04; 2. Hudson Lockette, Castle, 4:08.30; 3. Colby Otero, Kalaheo, 4:11.50; 4. Narayana Schneider, McKinley, 4:12.71; 5. Nicholas Arima, Iolani, 4:14.11; 6. Noah Roberts, Campbell, 4:14.15; 7. Garret Smith, Kapaa, 4:16.55; 8. Riley Lathrop, Punahou, 4:19.55. 400 relay–1. Punahou 42.18; 2. Baldwin 42.87; 3. Saint Louis 43.08; 4. Konawaena 43.49; 5. Kealakehe 43.52; 6. Leilehua 43.53; 7. Mililani 43.77; 8. Castle 43.94. 400–1. Aaron Rivas, Kaiser, 49.09; 2. Trenton Wailehua, Saint Louis, 49.30; 3. Hauoli Akau, Konawaena, 49.41; 4. Cooper Tirado, Kapolei, 49.59; 5. Keola Sanchez, Kamehameha Kapalama, 50.48; 6. David Tamura, Punahou, 51.24; 7. Franklin Scott, Radford, 51.59; 8. Zack Lietzke, Punahou, 51.90. 300 hurdles–1. Rey Cadiz, Baldwin, 38.90; 2. Lucas Milne, Punahou, 38.98, ; 3. Henry Nixon, Campbell, 39.82; 4. Michael Edwards, Radford, 40.17; 5. Payton Mulleitner, Kamehameha Kapalama, 40.25; 6. Chris Paige, Punahou, 40.68; 7. Justyce Kahunahana-Simms Kealakehe, 41.30. 800–1. Josiah Vallez, Konawaena, 1:58.42; 2. Austin Fortiner, Campbell, 2:01.18; 3. Samuel Wren, Kapolei, 2:01.20; 4. Sydney Mizukami, Kaiser, 2:01.56; 5. Hudson Lockette, Castle, 2:02.12; 6. Ryan Nakagawa, Punahou, 2:02.45; 7. Damien Stack, Kamehameha Hawaii, 2:03.84; 8. Joshua Graves, Voyagers, 2:04.24. 200–1. Andrei Iosivas, Punahou, 21.67; 2. Jacob Schmidt, Leilehua, 21.78; 3. Riley Patterson, Hilo, 22.37; 4. Vincent Terrell, Punahou, 22.50; 5. Isaiah Trice, Mililani, 22.75; 6. Darrian Cremer, Baldwin, 22.91; 7. Avery Curet, Iolani, 23.63; 8. Austin Ewing, Konawaena, 24.68. 3,000–1. Colby Otero, Kalaheo, 8:57.38; 2. Jason Wang, Iolani, 9:07.31; 3. Adam Harder, Hanalani, 9:08.43; 4. Alec Ankrum, Kealakehe, 9:20.94; 5. Narayana Schneider, McKinley, 9:22.55; 6. Noah Roberts, Campbell, 9:22.78; 7. Nicholas Arima, Iolani, 9:23.41; 8. Timothy Schiller, Mililani, 9:25.26. 1,600 relay–1. Punahou 3:19.74; 2. Konawaena 3:20.85; 3. Radford 3:24.43; 4. Kealakehe 3:27.10; 5. Leilehua 3:28.18; 6. Pearl City 3:28.33; 7. Kapolei 3:28.55; 8. Iolani 3:30.10. 400 unified relay–1. Maui High 50.61; 2. Pahoa 52.92; 3. Hilo ‘B’ 53.14; 4. Hilo 53.17; 5. Pahoa ‘B’ 56.88; 6. Maui High ‘B’ 58.26. 1,600 unified relay–1 Maui High 4:15.77; 2. Hilo 4:22.68; 3. Pahoa 4:32.74; 4. Hilo ‘B’ 4:38.24; 5. Pahoa ‘B’ 4:46.23; 6. Maui High ‘B’ 5:06.00.